If you’re going to be using Amazon this month please take a moment and name ABGC as your AmazonSmile designated charity. Your gift giving can also give a gift to the thousands of Annandale youth sponsored by our program each year. 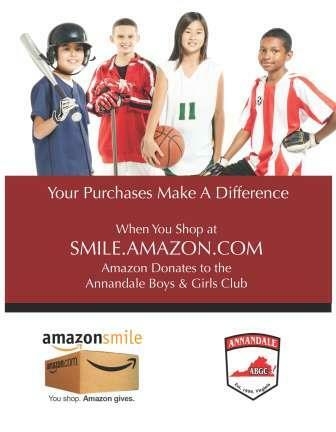 When you shop at smile.amazon.com, you’ll find the exact same low prices, vast selection and convenient shopping experience as Amazon.com, with the added bonus that Amazon will donate a portion of the purchase price to ABGC programs. There’s less than a week until Valentine’s Day and we hope that if you’ll be doing some shopping on Amazon you’ll help share some love with ABGC too! Your AmazonSmile donations help pay for ABGC’s many community programs and thousands of scholarships we offer each season to qualified families. It’s that time of the year when many families are already thinking about their holiday shopping. If you’re going to be using Amazon this month please take a moment and name ABGC as your AmazonSmile designated charity. You gift giving can also give a gift to the thousands of Annandale youth sponsored by our program each year.